At this price, we highly recommend it as a versatile, reliable accompaniment to any laptop or iPad DJ setup. Great price. Flexible. Easy to use. Excellent audio. No 1/4" or MIDI inputs. 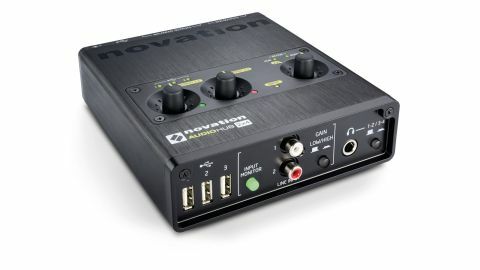 Novation's singular audio interface carves its own niche with the inclusion of a three-port USB 2 hub, thus boosting the number of ports on the host computer by two (it requires one for itself, of course, hooked up with the included high-vis green cable). The reason for such modernist connectivity is that it's squarely aimed at 'electronic' musicians, rather than instrumentalists, a fact made even clearer by its two phono inputs - you won't be plugging your guitar or mic into this one without an intermediary device of some sort. "It's not often that an audio interface gets us genuinely excited"
At the other end of the signal flow are four phono outputs (1/2, 3/4), two balanced 1/4" outs (1/2) and a 1/4" headphone socket with cue switching between outputs 1/2 and 3/4. All three stereo outputs (1/2, 3/4 and 'phones) get their own level knobs, complete with signal LEDs, and zero-latency monitoring is activated with a press of the Input Monitor button. The audio circuitry is by Focusrite, and Novation's claim of "super-loud" output is supported by the specs (+18.4dBu maximum on the balanced outs, +14dBu on the phonos, +14.7dBu on the headphones) and, indeed, experience - it really is very loud indeed. Inevitably, your laptop or iPad battery isn't going to deliver anywhere near enough juice to energise the three USB ports, which is where the included power supply comes in. Used solely as an audio interface, however, the Audiohub can be bus-powered. Given its electronica remit, we're undecided as to whether or not we're bothered by the lack of 5-pin MIDI I/O; but we would certainly welcome a 1/4"/XLR input/preamp or two. That said, it's not often that an audio interface gets us genuinely excited, but the Audiohub 2x4's combination of ease-of-use, clear usage proposition, USB hubbery and stellar audio quality has us as fired up as we can remember ever being about such a thing.